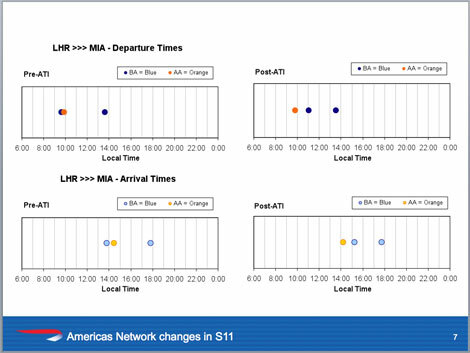 Joint venture carriers BA and American Airlines say they will effectively create a “transatlantic shuttle service between the top US-UK routes”, with hourly departures on the Heathrow-New York route. The carriers had outlined plans to align transatlantic services when the joint venture was officially launched in October last year (see online news October 6, 2010). 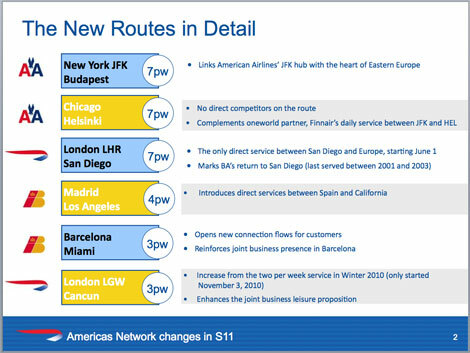 But more details have now been revealed, with the Heathrow-New York route set to see the biggest changes. 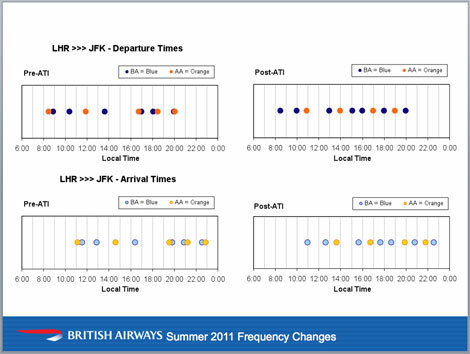 Whereas previously five of the daily 11 services offered by BA and AA had left “at almost exactly the same time”, these will now be spread across the day so that flights will depart Heathrow every hour on the hour, between 1300 and 2000. 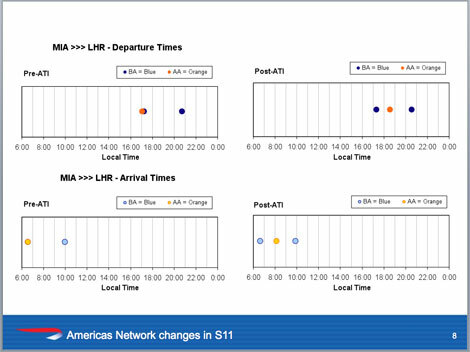 In addition there will be a maximum gap of one and a half hours between morning departures. 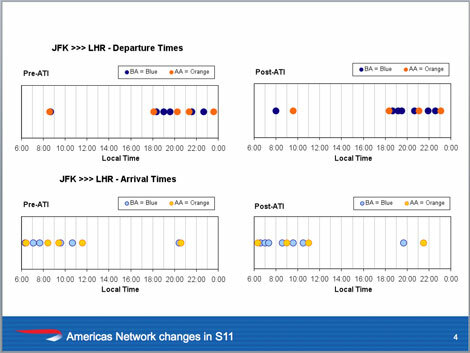 The graphic below shows this in more detail. 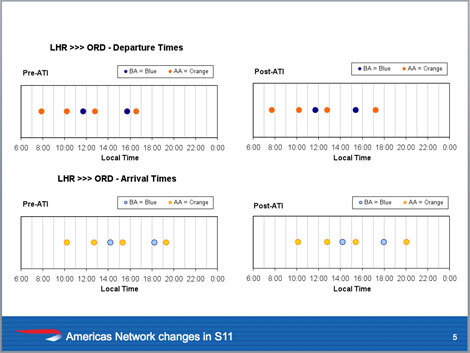 On the London-Chicago route flights will also be more evenly spaced out, with services departing Chicago at 1700, 1800, 1900 and 2000, instead of four flights departing at similar times between 1700 and 2000. 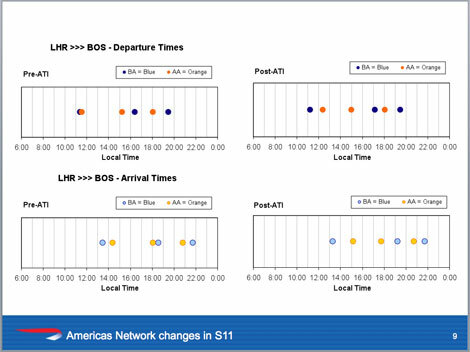 The 0900 and 2145 departures will remain unchanged. In addition the two flights from London to Miami which currently depart at around 1000 will now be spaced out to leave at 1000 and 1100, which the third departure at 1335. 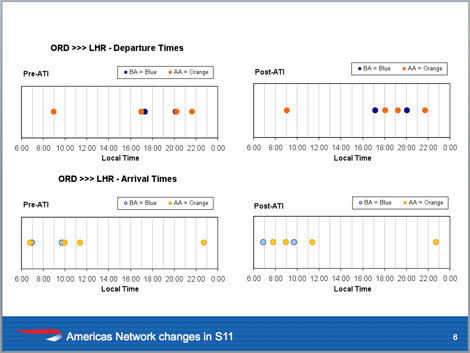 The graphics at the bottom of this article show all of the changes to transatlantic routes joint venture routes from Heathrow. 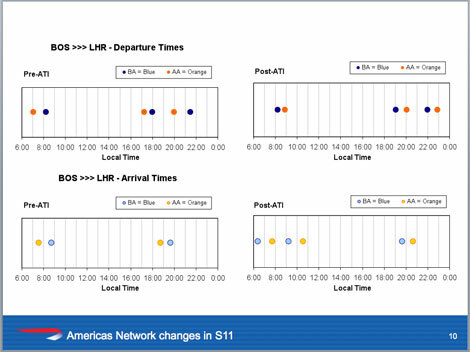 The changes come into effect from March 27, and this summer the BA/AA/Iberia joint venture will also see new services from JFK to Budapest and Chicago to Helsinki with AA, reinstated flights from Heathrow to San Diego with BA, and services from Madrid to LA, and Barcelona to Miami with Iberia. More details can be seen on the graphic below. The Spanish carrier is also launching a thrice-weekly service from Barcelona to Sao Paulo from June 19 (see online news March 15). For more information visit ba.com, aa.com, iberia.com.